Our all natural lip balm is packed with raw Shea Butter and selected oils to keep your lips moisturized and feeling soft. Ingredients: Beeswax, safflower oil, almond oil, apricot oil, jojoba oil, raw shea butter, coconut oil, meadowfoam oil, vitamin E (tocopherol), rosemary extract. 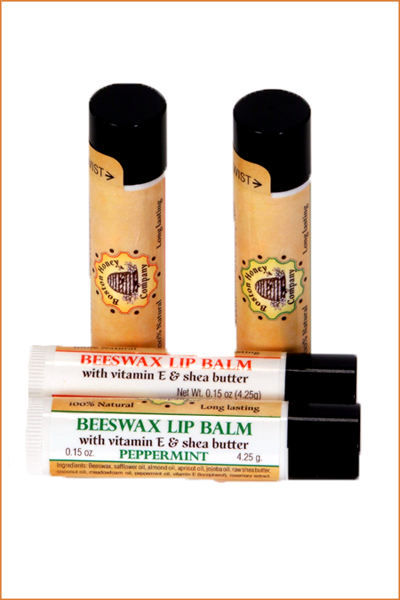 We offer our Lip Balm in two types: an unflavored balm, with Vitamin E and Shea Butter, and a natural Peppermint flavored variety, with Oil of Peppermint, Vitamin E and Shea Butter.